Our world values strength and a whole host of eye-catching attributes: power, ambition, wealth, and fierceness. But there is deep strength to be found in more subtle traits, such as gentleness and compassion. Gentleness is defined as mildness of manner or disposition. And compassion, often far too rare in our world, is defined as sympathy and concern for the sufferings or misfortunes of others. A compassionate person will treat others gently and with great respect and care. Pay attention to your tone of voice. Listen for any impatience or frustration that comes across in your words. Also pay attention to your body language. Keep your arms uncrossed, and be willing to be near to people (respecting their personal space, of course). Value people. Sometimes we are tempted to value things more than people, and when we do, we fail to act with compassion. Remember that people have great value; respect them as individuals, and be understanding of their own journey. Life has a way of challenging each of us differently, but when we are gentle with each other we give important encouragement and validation. Be generous. Being gentle and compassionate means being forgiving and understanding, and when we view others with a lens of generosity we can give out of a sense of abundance. When we feel a sense of ‘lack’ in our lives, or that we are missing things we think we should have, we often treat those around us out of that lack. So be generous. You can give to others without losing yourself.Be gentle with yourself. Acknowledge that there are times when you just need some extra compassion in your life. Maybe you are feeling worried or stressed, and have more on your plate than you can handle. During these times, remember that a gentle touch can give you the strength you need to continue. To the untrained eye, it seems counter intuitive to cut back a growing plant. Won’t this damage it? Why cut it back in its prime? Yet a seasoned gardener knows the importance of pruning, and pruning well. From fruit trees to topiaries to rare blooms, pruning helps ensure that a plant stays healthy and vigorous. Every would-be entrepreneur could stand to take a leaf from this book. Entrepreneurs already have the ambitious, dream-bigger mindset. We are constantly looking to reach higher and push harder, and we want everything to be done five minutes ago. But sometimes you have to take a big step back before you can take a massive leap forward. One of my classmates from Columbia Business School took a position as an executive assistant at American Express after earning her executive MBA. She got a lot of push-back from our fellow newly-minted EMBAs who considered her choice a serious step back. Actually, it was a well-calculated step back in the short term that propelled Jan into a very successful career in the long term. She worked directly for one of the global heads, and the fast visibility combined with her Ivy credentials meant that she was promoted after just three months and now runs that entire group. Throughout my finance career, I worked toward an overarching goal: fiduciary-level wealth management. [A fiduciary standard legally requires the advisor to act in the best interest of the client, which is not the way the major Wall Street firms are set up.] My path was paved with experience in private equity, fixed income trading, investment banking and private wealth management before I finally become a financial advisor. That, in the world of Wall Street, was actually considered a step down. Being a — excuse my French — broker isn’t considered to be anywhere near as prestigious as my previous work in finance. My peers scoffed at my decision to take the position, but the training I received was critical in learning how to run the client-facing end of institutional investment management. My experiences as a rank advisor in the brokerage realm honed my determination and vision to create something better. I learned first-hand about the games, commission payment structures and training programs on Wall Street that promote the interests of firms over clients — the very aspects of wealth management that I now work to change. That step back helped me take the leap forward into what is now Lexion Capital. The position was seen as one (low) rung in the ladder, but I would have stumbled had I not climbed it. The key in my story and in that of my friend from business school is that we had two essential elements: personal vision and a specific goal. We were headed, ultimately, for something bigger and better, so we weren’t afraid to veer from “path of least resistance forward” in order to get there. Most people do pursue paths that are more linear, and there is nothing wrong with reaching success that way. Unless you have full faith that your step back will absolutely propel you in new, exciting directions, don’t do it. It is your determination and belief in your own success that will make the difference in uncharted territory. If you do have big entrepreneurial dreams, know that it’s okay to prune your own career branches for the sake of better things to grow in their place. If it makes strategic sense for your overall career vision, don’t be afraid to cut back. Strategically prune yourself. Bloom into something even bigger. We’ve always like that phrase because it is a dignified and courteous reminder that the way we present ourselves to one another matters greatly. This is never truer than it is in a professional context. It should go without saying that the quality of your work matters, but the way you conduct yourself and the image you project are of great importance, too. To put it simply, people like to work with other people who are clean, collected, well-mannered and polite. No one wants to work on a project with a coworker who is sloppy, and people will avoid a team member who is mean, spiteful or rude. Remember — each of us is always on stage. You make have heard the saying, ‘You only get one chance to make a first impression.’ To that, we’d add that it only takes one misstep — one instance of thoughtlessness, one day of poor personal appearance — to undo many days of meticulous upkeep. This is why it’s vital to be consistently courtly and polite. So, back to that sign on the Ritz Carlton; if you can carry yourself like a lady or gentleman in any work-related context, chances are that you are well on your way to being the sort of worker employers value and coworkers want to be around. As we all know – in the wine and spirits industry we always want to be that person on and off the stage. The workplace can be a stressful environment, especially when people must work together to find solutions to urgent and complex problems. Inevitably, not everyone in the workplace agrees with one another, and it can be difficult to propose new ideas when they carry the possibility of catalyzing disagreement and conflict. It’s important to continue contributing new ideas even though not everyone may agree with you. In addition, it’s equally important to know when to graciously defend your ideas, and when to allow for the possibility that you could be wrong. Being wrong feels like being right. In the workplace, and in life, it’s essential to keep in mind that being wrong can feel exactly like being right. Kathryn Schulz explored this idea in a recent TED talk, in which she points out that there’s nothing that feels inherently different about being wrong compared to being right. Thus, it’s necessary to accept that an idea that feels completely on-target could still potentially benefit from improvement. What don’t others agree with, and why? After accepting that not all of our ideas are right, or are the best solution to a particular problem, it’s important to take a moment to ask what it is that others don’t agree with. Seeing our ideas from another person’s point of view can help us think critically and objectively about our ideas in order to determine whether we should continue to defend them, or whether we should let them go. Ask for specific alternate solutions. If somebody has spoken up in order to disagree with your idea, he or she should be prepared to offer an alternative solution. It’s easy for others to criticize, but if they do so they should be able to back up their own ideas. For example, ask those who disagree to tell you which solutions they think would be better suited to solve a particular problem. To learn more about achieving success and improving your workplace environment, please visit our website or blog for a variety of articles. If you have any questions or comments, please feel free to contact us! Curiosity is an important trait of a genius. I don’t think you can find an intellectual giant who is not a curious person. Thomas Edison, Leonardo da Vinci, Albert Einstein, Richard Feynman, they are all curious characters. Richard Feynman was especially known for his adventures which came from his curiosity. 2013 is a new year. A new time for all of us to discover what makes each of us unique and wonderful and how we pull that back into the universe. In the Wine Industry, curiosity is the mainstay of our existence. Ask any Winemaker, if it wasn’t for curiosity wine would not be what it was is today. With the shrinking of the individual family wineries and the drive to recreate over and over again the same wine flavor profiles we may be losing what makes us special on many levels. Not allowing ourselves to take the time to allow curiosity and discovery to take over we will lose what makes us special. If you discover that you have been in the weeds and lost your way to curious behavior..I have listed a few ways to take it back. It makes your mind active instead of passive Curious people always ask questions and search for answers in their minds. Their minds are always active. Since the mind is like a muscle which becomes stronger through continual exercise, the mental exercise caused by curiosity makes your mind stronger and stronger. It makes your mind observant of new ideas When you are curious about something, your mind expects and anticipates new ideas related to it. When the ideas come they will soon be recognized. Without curiosity, the ideas may pass right in front of you and yet you miss them because your mind is not prepared to recognize them. Just think, how many great ideas may have lost due to lack of curiosity? It opens up new worlds and possibilities By being curious you will be able to see new worlds and possibilities which are normally not visible. They are hidden behind the surface of normal life, and it takes a curious mind to look beneath the surface and discover these new worlds and possibilities. It brings excitement into your life The life of curious people is far from boring. It’s neither dull nor routine. There are always new things that attract their attention, there are always new ‘toys’ to play with. Instead of being bored, curious people have an adventurous life. This is essential if you are to have a curious mind. Be open to learn, unlearn, and relearn. Some things you know and believe might be wrong, and you should be prepared to accept this possibility and change your mind. If you just accept the world as it is without trying to dig deeper, you will certainly lose the ‘holy curiosity’. Never take things as granted. Try to dig deeper beneath the surface of what is around you. A sure way to dig deeper beneath the surface is asking questions: What is that? Why is it made that way?When was it made? Who invented it? Where does it come from? How does it work? What, why, when, who, where, and how are the best friends of curious people. Whenever you label something as boring, you close one more door of possibilities. Curious people are unlikely to call something as boring. Instead, they always see it as a door to an exciting new world. Even if they don’t yet have time to explore it, they will leave the door open to be visited another time. If you see learning as a burden, there’s no way you will want to dig deeper into anything. That will just make the burden heavier. But if you think of learning as something fun, you will naturally want to dig deeper. So look at life through the glasses of fun and excitement and enjoy the learning process..
Don’t spend too much time on just one world; take a look at another worlds. It will introduce you to the possibilities and excitement of the other worlds which may spark your interest to explore them further. One easy way to do this is through reading diverse kinds of reading. Try to pick a book or magazine on a new subject and let it feed your mind with the excitement of a new world. Ok, now that you have had good read about curiosity, if you are curious about the Benchmark process – please give us call 707 933 1500 or shoot us an email. We would be delighted to connect with you. The rosiest take on the jobs report is that the aging of the country’s population has made the employment statistics look worse than they really are. That rosy take, in brief, goes like this: Yes, the percentage of Americans with jobs may not have risen much in the last couple of years. But the unemployment rate has fallen substantially during that time, and the unemployment rate is a better measure of the health of the labor market because its calculation excludes people who have stopped looking for work. With more people aging into retirement – the leading-edge baby boomers are now in their late 60s – it’s perfectly natural for more people to have stopped looking for work. The fact that the percentage of adults with jobs has held steady, rather than declined, is a sign that the economy is getting healthier. 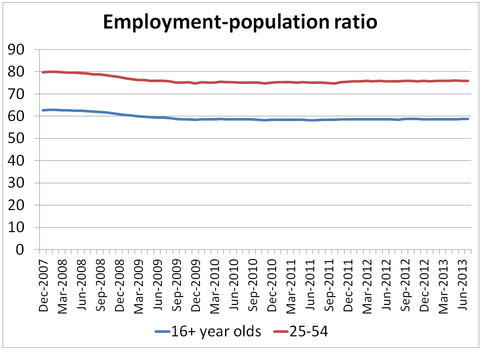 To figure out whether this take is basically correct (and whether those of us emphasizing the lack of increase in the employment-population ratio have been too downbeat), you can look at the employment-population ratio for people 25 to 54 years old. They are in the prime of their working lives, old enough to have graduated from high school or college and young enough not to be retired. Yet it’s hard to take too much comfort in this chart. The percentage of prime-age Americans with jobs fell sharply during the 2007-9 downturn. 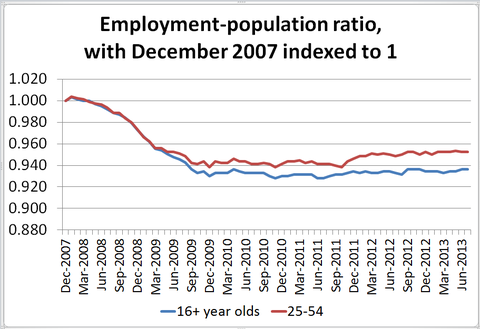 It did not budge from 2009 through mid-2011, before rising somewhat in late 2011. In the last year and a half, it has not risen much further. People who prefer money to these other kinds of compensation may be “hired guns,” the kind who hang around right up until a better-paying gig comes along. But the people who thrive in an environment that prizes respect and opportunity are likely to stay, to be more invested in their work, and to create value for themselves and the organization – all things that money can’t buy.People who prefer money to these other kinds of compensation may be “hired guns,” the kind who hang around right up until a better-paying gig comes along. But the people who thrive in an environment that prizes respect and opportunity are likely to stay, to be more invested in their work, and to create value for themselves and the organization – all things that money can’t buy. When it comes to deciding what to pay your new hires, you want to be right on the money. Like a lot of us in the wine industry Mr. Mondavi was more than just another employer or vintner ..he was a true inspiration. He valued the connection between people, food and wine and family. It is a great honor for us at Benchmark Consulting to honor Mr. Mondavi and hope to continue on in his shadow of undying commitment to the best. This June 18th marks what would have been Robert Mondavi’s 100th birthday; he passed away in 2008 at the age of 94. It’s been almost six yearsand we are still commemorating the man who is best known as the Father of American Wine. His life story reads better than an epic novel rife with risk-taking, vision and of course family drama. Born in Virginia, Minnesota to Italian immigrant parents, Cesare and Rosa, wine was always part of life for Mondavi. The family moved to California where Robert later attended high school in Lodi and eventually Stanford University. In 1943, his parents, after much urging from Robert, purchased Charles Krug Winery in Napa and Robert joined the enterprise along with his brother Peter. The drama began in 1965 when Mondavi was ‘fired’ from the winery over major disagreements about winemaking direction and vision. Shortly after his dismissal, Robert purchased his own winery in Oakville with the specific goal of making world-class wines that could compete with anything in Europe. It all sounds so obvious to us now, but in the 1960’s Napa was just farmland. According to the late Mondavi’s wife, Margrit Mondavi, ” In 1960 the Valley was still kind of like a little country town, I think there were 17,000 acres of grapes, today there are 40,000. There wasn’t a paved road. Much of the Valley was for sale; it was still sort of recuperating from the war and the Depression and all of that. Many people didn’t believe in it. But he went forward, built a new winery, the first new winery since Prohibition. Today the winery is in corporate hands, but the legacy of Mondavi’s belief and passion lives on though the countless small producers who populate the Napa Valley, and the United States as a whole. His philanthropy is also a legacy with his $10 million dollar gift to the University of California at Davis for the Mondavi Center for the Performing Arts and $25 million for the Robert Mondavi Institute for Wine and Food Science. He not only championed premium wine, he elevated the very idea of American wine and food as something to be celebrated, shared and savored. The winery will be hosting several events to honor this anniversary, including a concert with Martina McBride. Festivities begin on June 29th, for additional information and to purchase tickets, Click Here or visit eventbrite.com or call 1-888-769-5299. All additional inquiries can be sent to concerts@robertmondaviwinery.com. If you were looking for teams to rig for success, a call center would be a good place to start. The skills required for call center work are easy to identify and hire for. The tasks involved are clear-cut and easy to monitor. Just about every aspect of team performance is easy to measure: number of issues resolved, customer satisfaction, average handling time (AHT, the golden standard of call center efficiency). And the list goes on. Why, then, did the manager at a major bank’s call center have such trouble figuring out why some of his teams got excellent results, while other, seemingly similar, teams struggled? Indeed, none of the metrics that poured in hinted at the reason for the performance gaps. This mystery reinforced his assumption that team building was an art, not a science. The truth is quite the opposite. At MIT’s Human Dynamics Laboratory, we have identified the elusive group dynamics that characterize high-performing teams—those blessed with the energy, creativity, and shared commitment to far surpass other teams. These dynamics are observable, quantifiable, and measurable. And, perhaps most important, teams can be taught how to strengthen them. When we set out to document the behavior of teams that “click,” we noticed we could sense a buzz in a team even if we didn’t understand what the members were talking about. That suggested that the key to high performance lay not in the content of a team’s discussions but in the manner in which it was communicating. Yet little of the research on team building had focused on communication. Suspecting it might be crucial, we decided to examine it more deeply. Why Do Patterns of Communication Matter So Much? Yet if we look at our evolutionary history, we can see that language is a relatively recent development and was most likely layered upon older signals that communicated dominance, interest, and emotions among humans. Today these ancient patterns of communication still shape how we make decisions and coordinate work among ourselves. Consider how early man may have approached problem solving. One can imagine humans sitting around a campfire (as a team) making suggestions, relating observations, and indicating interest or approval with head nods, gestures, or vocal signals. If some people failed to contribute or to signal their level of interest or approval, then the group members had less information and weaker judgment, and so were more likely to go hungry. For our studies, we looked across a diverse set of industries to find workplaces that had similar teams with varying performance. Ultimately, our research included innovation teams, post-op wards in hospitals, customer-facing teams in banks, backroom operations teams, and call center teams, among others. We equipped all the members of those teams with electronic badges that collected data on their individual communication behavior—tone of voice, body language, whom they talked to and how much, and more. With remarkable consistency, the data confirmed that communication indeed plays a critical role in building successful teams. In fact, we’ve found patterns of communication to be the most important predictor of a team’s success. Not only that, but they are as significant as all the other factors—individual intelligence, personality, skill, and the substance of discussions—combined. Patterns of communication, for example, explained why performance varied so widely among the seemingly identical teams in that bank’s call center. Several teams there wore our badges for six weeks. When my fellow researchers (my colleagues at Sociometric Solutions—Taemie Kim, Daniel Olguin, and Ben Waber) and I analyzed the data collected, we found that the best predictors of productivity were a team’s energy and engagement outside formal meetings. Together those two factors explained one-third of the variations in dollar productivity among groups. Drawing on that insight, we advised the center’s manager to revise the employees’ coffee break schedule so that everyone on a team took a break at the same time. That would allow people more time to socialize with their teammates, away from their workstations. Though the suggestion flew in the face of standard efficiency practices, the manager was baffled and desperate, so he tried it. And it worked: AHT fell by more than 20% among lower-performing teams and decreased by 8% overall at the call center. Now the manager is changing the break schedule at all 10 of the bank’s call centers (which employ a total of 25,000 people) and is forecasting $15 million a year in productivity increases. He has also seen employee satisfaction at call centers rise, sometimes by more than 10%. Alex “Sandy” Pentland is a professor at MIT, the director of MIT’s Human Dynamics Laboratory and the MIT Media Lab Entrepreneurship Program, and the chairman of Sociometric Solutions. Name-dropping is a technique that might seem smart during an interview, but experts say that most good hiring managers will see right through it and the ploy could backfire drastically. Chad Oakley, president and chief operating officer of the Charles Aris recruiting firm, has personally placed hundreds of people in 100K-plus jobs, but he says that some have missed out because of name-dropping. “If it’s done inappropriately, it can come across as egotistic and pretentious and can backfire,” he said. However, in some fields your most valuable attribute could be who you know. In these cases, it’s not inappropriate to mention your contacts — just do it directly. “If you’re a salesperson and you have a world-class Rolodex, that’s an asset that should be discussed,” Oakley said. “If you want the person on the other side of the table to know that you know someone, you should just say it. Don’t name-drop it.